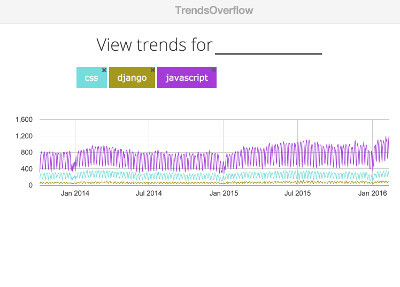 TrendsOverflow is a very simple website that displays the number of questions per day for the most popular programming languages from Stack Overflow. I created this application because I wanted to compare the popularity of different languages. I tried to use Google Trends but sometimes Google mixes data from programming languages and non-programming languages. I thought that data from Stack Overflow would be more accurate than the popularity provided by Google Trends, so I decided to retrieve this information by myself. As I did not find any published website offering this information, I decided to develop this very simple application by myself. To use, just visit the website, trendsoverflow.educalleja.es, and enter your search terms. Only tested in Chrome. Let me know if you have any issues! Report any issue or comment in the TrendsOverflow GitHub repository. Website wrote in Flask, Sqlite, SQLAlchemy. Feel free to play with the code available at the GitHub repository. Browse other questions tagged app website statistics .